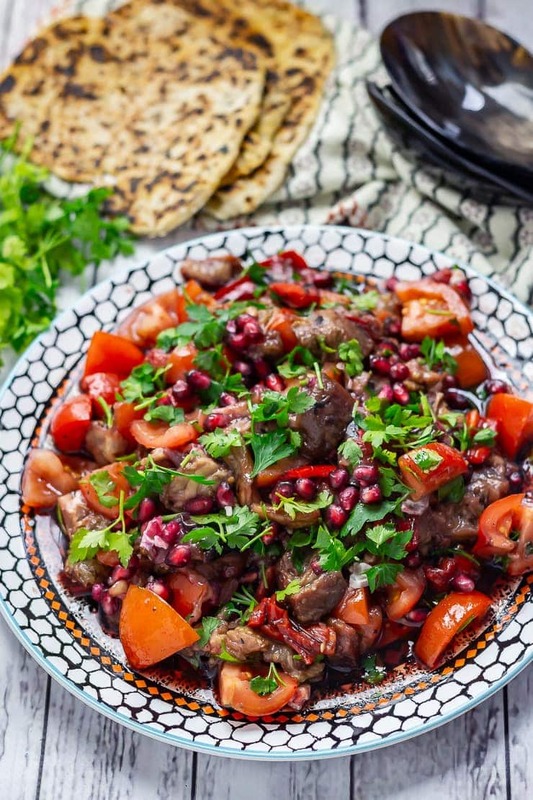 Aubergine and red pepper are cooked over an open flame to make this aubergine salad full of smoky flavour. 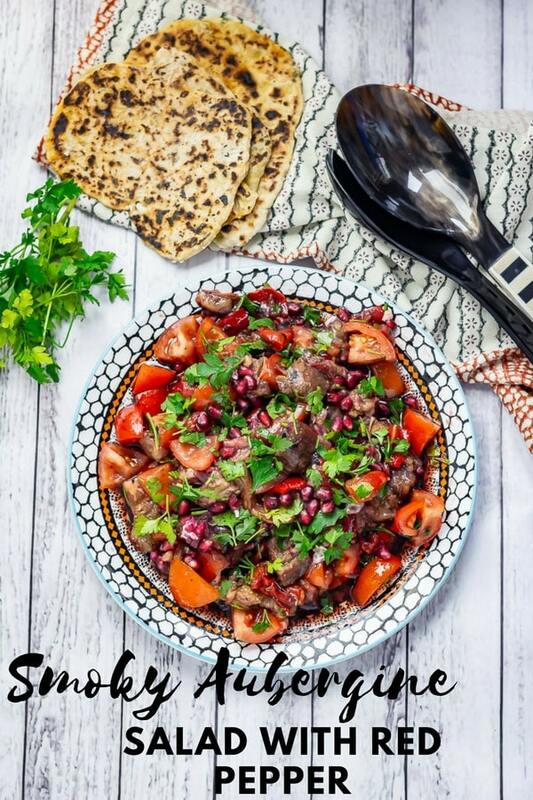 After the vegetables are cooked they’re dressed with a mixture of pomegranate molasses and sumac and tossed with tomatoes for the perfect summer salad! We really should eat more salads. Being the carb loving, cheese loving, meat loving person I am I tend to veer more towards hearty meals which make me feel all warm and full inside. In summer though I start to feel the odd salad craving and that’s when I decide to try and come up with something that doesn’t involve any of my favourite food groups but still has enough flavour to keep me satisfied. 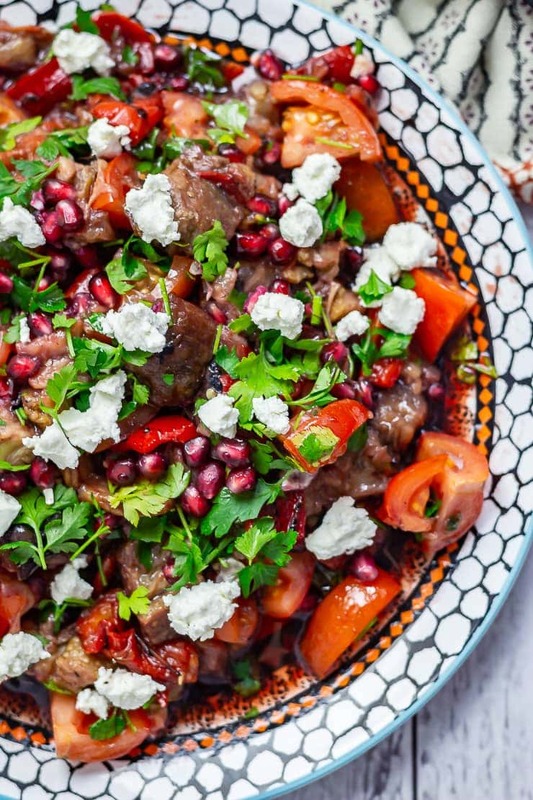 And this smoky aubergine salad definitely delivers. It’s been beautiful weather here the past few days. We even had a barbecue yesterday which definitely indulged my meat loving persona. 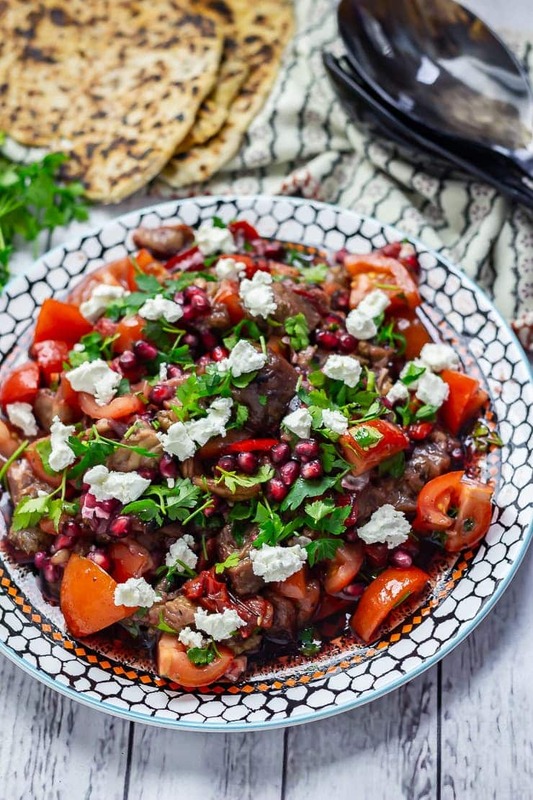 Although this aubergine salad on the side definitely wouldn’t have gone amiss! 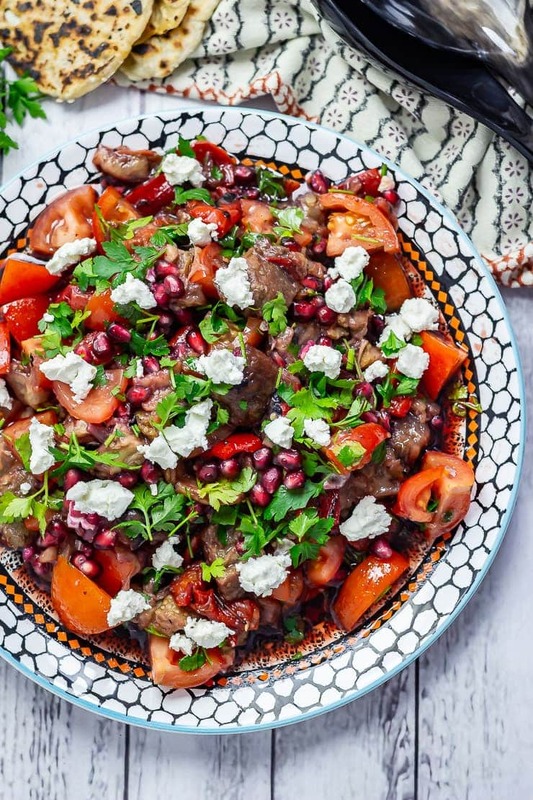 In fact, you could use a barbecue to cook the aubergine and red pepper and it would work so well to get that smoky flavour which really sets this salad off. Since the British weather was doing its much more familiar thing of being cold and miserable when we made this salad we roasted our aubergine and pepper over the open flame of our hob (stovetop). The first couple of times I did this I was a bit freaked out about it and was worried I was about to cause a fire but now that I’ve got a taste for that smoky flavour it’s totally worth the effort of using this method. 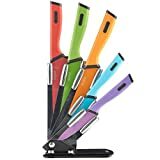 I tend to do it on a medium high heat and use tongs to gently turn the aubergine and pepper every few minutes until the skin is blistered and the vegetables feel really soft. If you’re worried about making a mess I have seen a tip to put foil around the base of your hob but I haven’t tried it myself. Once the aubergine and pepper have cooked through and the skin is blistered I put them in a bowl covered with cling film to allow them to steam for 20 minutes or so to make it easy to remove the skins. Then simply peel them and chop them all up. Place the chopped vegetables with tomatoes, pomegranate and all kinds of other yumminess in a bowl and mix it together. The dressing for this aubergine salad uses some simple, fresh and flavourful ingredients whisked together while the vegetables are cooking. Of course there’s olive oil and garlic, two of the dreamiest ingredients of all. Then I added lemon juice, sumac and pomegranate molasses for a hint of sweet and sour. 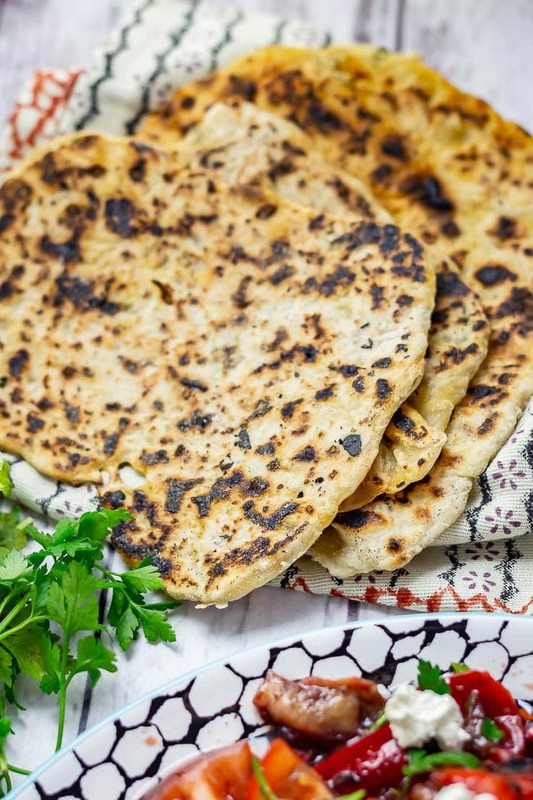 We served our salad with some homemade Turkish flat bread and plenty of fresh parsley. Oh, and of course feta. Come on now, you didn’t expect me to go no cheese at all right? But that saltiness really works with the smoky flavour of the vegetables and adds a lovely creaminess to the final dish. Obviously aubergine and feta are just a dream combination, it features in quite a few of my favourite aubergine recipes. Want more? Try these other aubergine recipes! 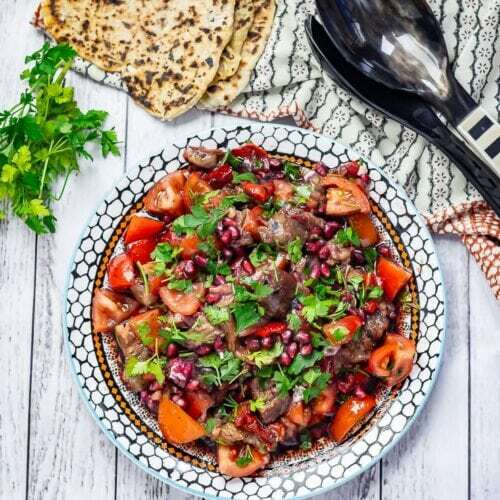 Aubergine and red pepper are cooked over an open flame to make this aubergine salad full of smoky flavour. 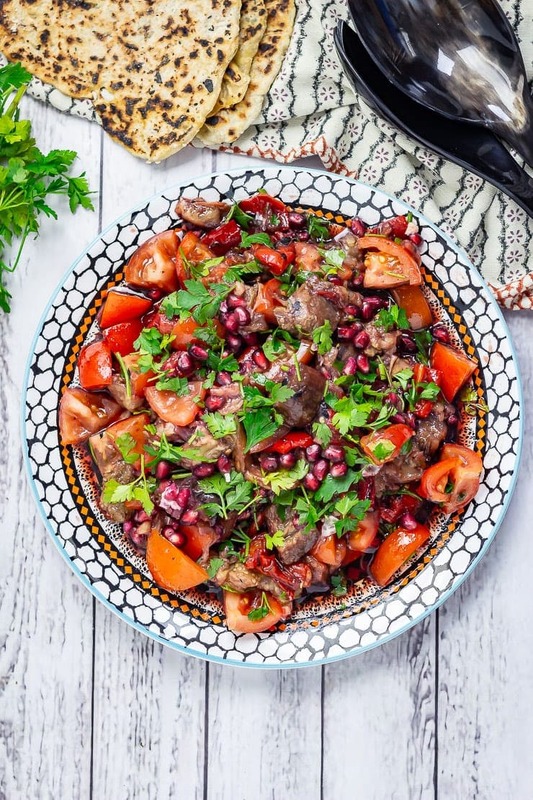 After the vegetables are cooked they're dressed with a mixture of pomegranate molasses and sumac and tossed with tomatoes for the perfect summer salad! Cook the aubergine and peppers over the flame of a gas hob until the skin is blistered and the flesh is soft. Place into a bowl covered with cling film and allow to steam while you make the rest of the salad. If you don't want to cook the vegetables over a flame then you can roast them on a high heat until the skin is blackened and the flesh is soft. For the dressing whisk together the olive oil, garlic, lemon juice, sumac, pomegranate molasses and most of the seeds from the pomegranate. When the aubergine and pepper are cool enough to touch peel away the skins and chop, removing the stalks and the seeds from the pepper. Place in a bowl with the tomatoes and most of the parsley. Drizzle over the dressing and tip onto a serving plate. 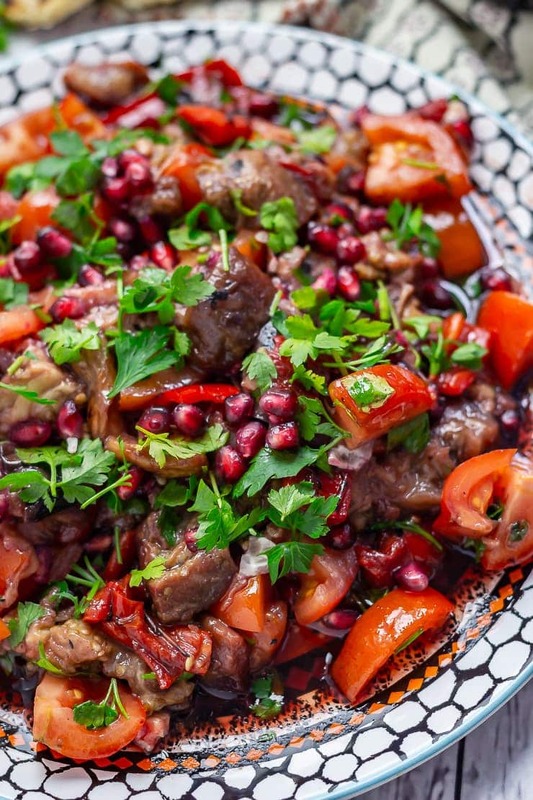 Serve with the rest of the pomegranate seeds and parsley sprinkled on top. everytime I visit here I have to go in the kitchen to make something to eat your recipes make me so hungry everything looks fabulous and I love how colorful this salad it. Going to try it for lunch! Pour the wine and pass the flatbread. I’m in! What a flavorful looking salad! We forget that salads don’t have to revolve around greens. This looks like a great way to switch it up! This looks absolutely delicious! I’m loving all the flavours in this dish! It took me a while to finally like eggplant. This looks delicious and a great way to enjoy this veggie for sure. I would love this for dinner any night. 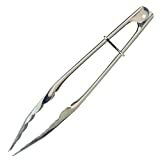 Yeah, I know it can be a bit of a love/hate thing but this is such a great way to eat it!